Burger Bash is back this month at HEB, celebrating the summer staple and providing you with the inspiration and Primo Picks to get your very best burger on the table. Me? 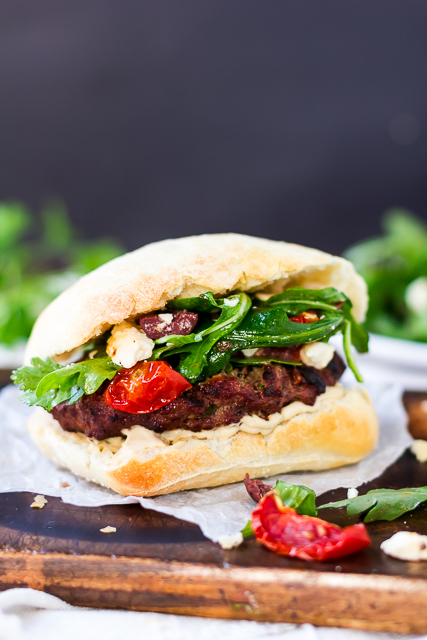 I am here to share some grilled summer love with their Mediterranean Lamb Burger. 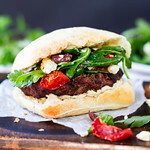 This burger combines ground lamb generously seasoned with mustard, garlic, cumin, and a handful of fresh herbs (mint, oregano, and parsley), a fresh, summery salad of arugula, kalamata olives, sundried tomatoes, and feta dressed with lemon and olive oil, all served on chewy ciabatta rolls spread with hummus. Every bite is bursting with fresh, Mediterranean flavors. 1. Not over-working the uncooked ground meat. 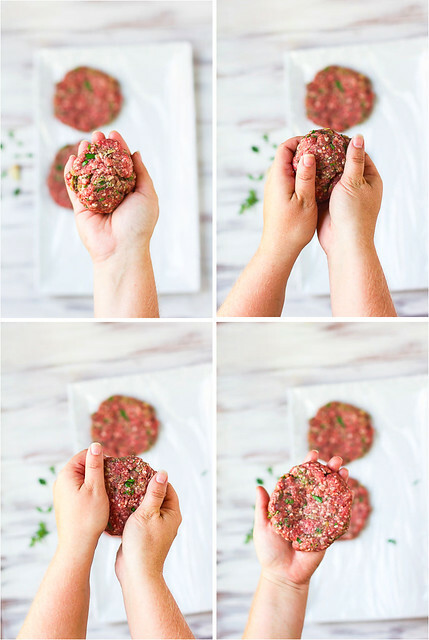 I use “the steering wheel” method to make patties: I start with a ball and with both hands, begin turning it while using light pressure from my fingers to create perfectly round, divoted on the bottom side patties in 5 seconds. 2. Not pressing down on the patties while they are cooking. Please don’t. 3. Not over-cooking the patties. Lamb can be tricky and gets a bad rap. But I know that on my grill, it’s 4 minutes on one side, 3 on the other to hit that perfectly juicy medium burger. 4. The perfect toppings. Mustard, pickles, and tomatoes? Chile, cheese, and Fritos? Pimento cheese and fried green tomatoes? From here, the world is your naked bun and empty plate. This recipe was developed in conjunction with H-E-B and I was provided a gift card with which to purchase ingredients. Messy fingers, stretchy-waisted pants, and future therapy bills for my child are all mine. You can find H-E-B on Facebook, Twitter, and Pinterest. And if you’re as lucky as we are, 3 locations within a 5 mile radius. Now start grilling. 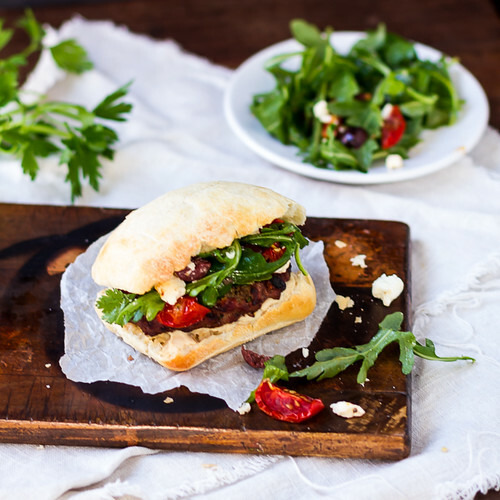 Juicy, grilled lamb burgers topped with a flavorful Mediterranean salad. 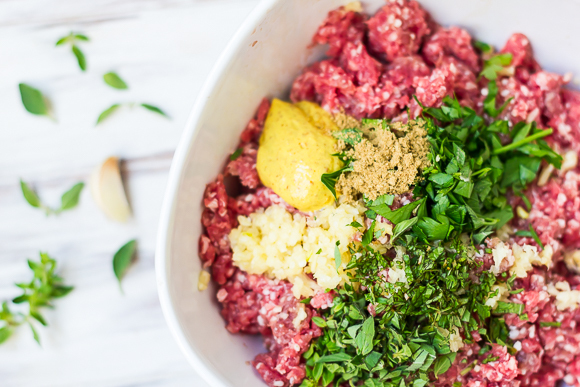 While grill is heating, combine the lamb, mustard, parsley, oregano, mint, cumin, and garlic in a large bowl with a generous pinch of salt and several grinds of black pepper. Mix well and form into 4 patties. Grill burgers, turning once, until cooked to desired doneness (~3-4 minutes a side for medium, medium-well). In another bowl, combine feta, arugula, olive oil, lemon juice, sundried tomatoes and olives. Toss to combine. Lightly grill ciabatta buns; spread hummus on buns. Place 1 burger on the bottom half of the bun, add mixed greens and the bun top. Oh wow, I have got to make these ASAP! They look so tasty. Lamb Burgers are my favorite! Delicious Looking Recipe Here!